Today, I discovered that my HP inkjet printer will print beautifully on the uncoated side of Reynold’s Freezer Paper. 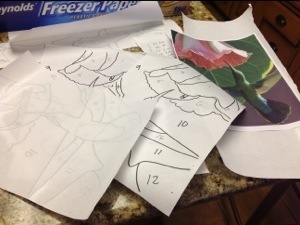 That means an easy way to replicate designs for appliqué. And, an easy way to do multiple copies of a pattern I made. When I use Rose Hughe’s fast piece applique technique sometimes I want to separate out smaller particles or focal objects to layer on top. Making copies of my pattern with the printer will make this really quick!